Racing fans in the Saratoga Springs, N.Y. area will have multiple opportunities to see Funny Cide—the only New York-bred to have won the Kentucky Derby (gr. I)—from Aug. 3-8. 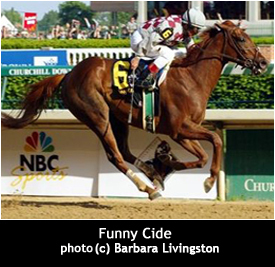 SARATOGA SPRINGS — Want to see Funny Cide? You’ll get your chance next week when the 2003 Kentucky Derby and Preakness winner will be in town from Tuesday through Sunday. The New York-bred will be the special guest at Fasig-Tipton’s “Weanling to the Winner’s Circle” seminar at the Humphrey S. Finney Pavilion on Sunday, Aug. 8 at 9 a.m. (registration at 8:30 a.m.). All contents © copyright 2003-2011 Funny Cide Ventures, LLC. All rights reserved. All images © copyright 2003-2011 Skip Dickstein, Mike Kane and/or Dave Harmon All rights reserved.